Turn-Time Plus! 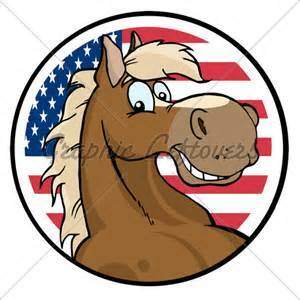 is designed to uncover horses whose ‘bursts of speed’, so to speak, are hidden from most player’s eyes in the pp lines. The author’s unique formula combines different turn-time scores (less penalties for distances that are actually shorter or longer than the the reported distances – for example, the first fraction clock does not start until 70 yards into the race). 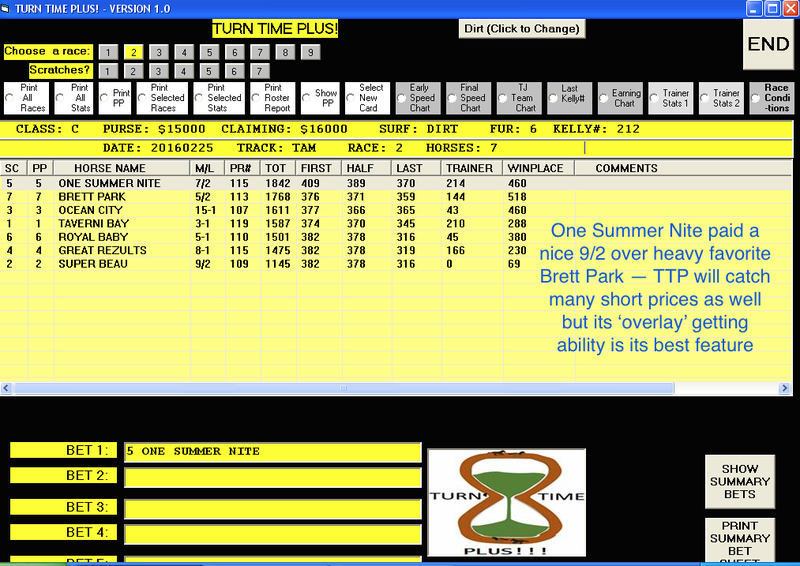 It then uses formulas for Trainer/Jockey strength and calculations for consistency. When totaled together you have a unique ‘overlay-producing’ software program. screen shot below – Arch Leader was overlooked in the wagering, a very common scenario with TTP. 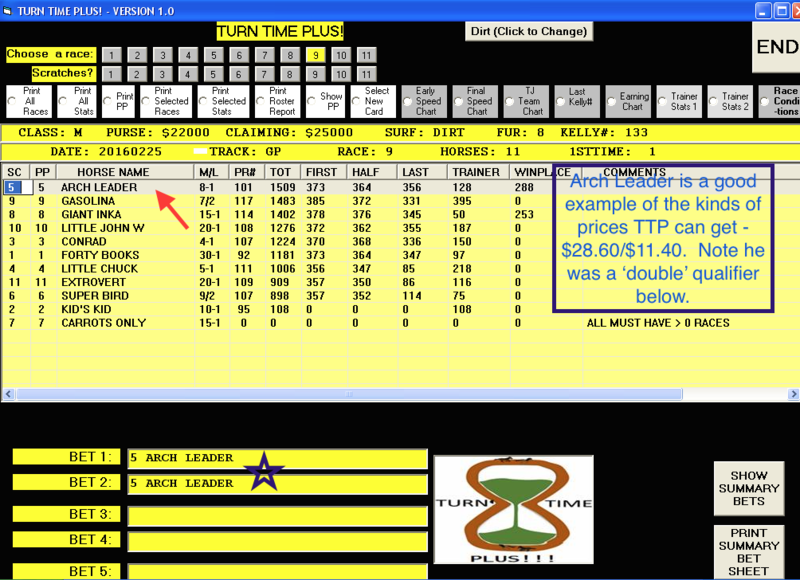 Since the theory behind Turn-Time Plus is extremely sound from a race-analysis point of view, the software can be used to not only spot overlooked horses with a pace advantage but for the more aggressive bettor boxing the top four or five scorers in Exactas/Trifectas (in larger fields) can pay some serious dividends as often two price horses appear in the payoffs. The TRAINER column is also interesting in that very often the winner is from the top three scorers and often the top two. In races where there are two picks or the point spread is very small between the first three horses, the TRAINER column is often a good separator. TTP is very adept at selecting solid favorites as well. If a horse is the favorite or near-favorite and has a TOTAL score that is 90 points or higher than the second-highest scorer, this horse is very likely to run a big race. Len did two database tests, one of 11,454 races and one of 16,811 races. While the win rate hung around 31% in both samples, the most intriguing finding was that top-rated horses (regardless of point spread) who had a morning line of 9/2 or higher, returned a solid +26% ROI for the win and an 11.3% profit on the place. 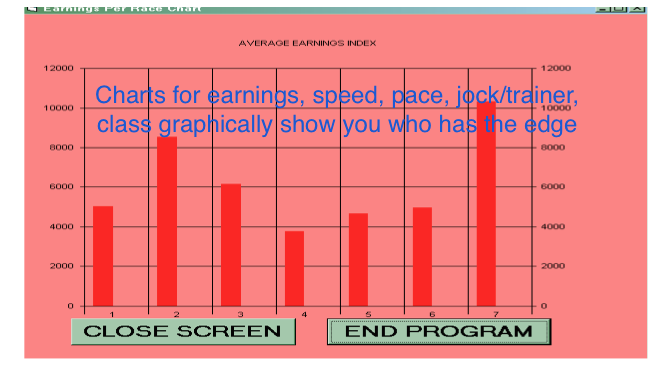 >>Of course, the program also includes our very popular regular features … speed/pace/jock/class/earnings charts, view/print daily program, view/print past performances, view print Summary Bet sheet, up-to-the-minute Trainer stats (overall stats and situations that apply to today’s race) etc., etc., etc. Have fun with TTP! The program will locate ‘hidden pace’ horses on a very consistent basis. 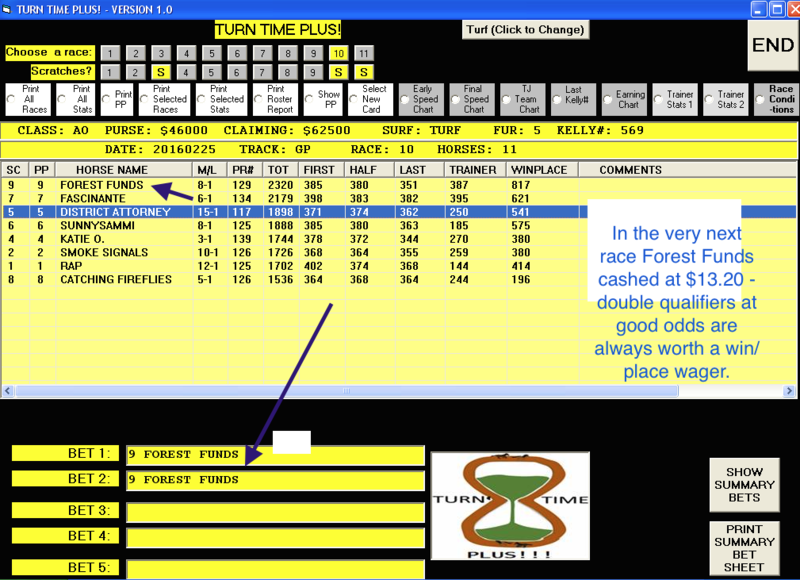 And, even more fun, The Turn-Time Plus! Software is very reasonably priced at just $67.50! Program is downloadable from our download website and/or you can receive the package in the mail. Call us at 1-800-696-0067 or order from the website. Thanks! and call us with any questions you may have.